The social media giant WhatsApp is updating its app at some interval of time. Day by day WhatsApp providing new features to the users. 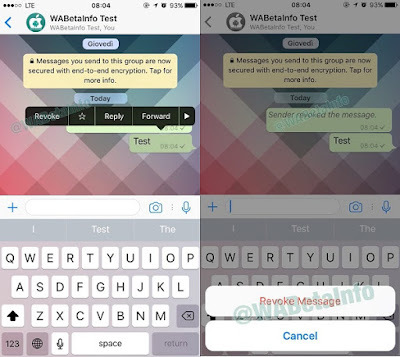 The upcoming features of WhatsApp may be edit and revoke message. WhatsApp will let its iPhone app to edit and revoke sent message. This feature is disable by default for WhatsApp for iPhone beta app so it may be available soon. WhatsApp users will now revoke message they sent that mean the sent message never existed. User can revoke message in the case if the receiver has not seen that message from sender. If the receiver has already seen that message than you can not revoke it. Currently user can delete messages from its own device but that message remain visible to the receiver's device. This upcoming features will work by long pressing a sent message. We do not know when these feature will be available to WhatsApp for Android beta users. Recently the company rolled out a feature in which user were able to play videos right away without waiting for it to download first. The company also released feature to support animated GIF files to non beta users. The company is also testing one more feature to preview archive files - ZIP and RAR files.